If you are anything like I was at the beginning of my spiritual journey you are feeling a little bit overwhelmed and you are not really sure where to start. There is so much information out there and it can be really confusing. I have found that a lot of the information that is out there doesn’t really align with my truth because it does not help people connect to themselves. It is more about spiritual teachers positioning themselves as gurus, who have all the answers, that you can only get from them. That just doesn’t resonate with me at all. You are your own guru. You have all the answers you seek inside of yourself, you just might need some help finding your path. It is my goal to help you connect to yourself, your inner wisdom, your higher self, and manifest your dreams. Your spiritual journey will be unique to you. I have put these eight tips together to help you. They are the things I wish I knew at the beginning of my journey and it is my hope that they help you on your path to discovering your truth and soul’s purpose. With any changes you wish to make in your life it is important to start small. The last thing you want is to feel overwhelmed and end up giving up. Starting a spiritual journey and practice may feel totally foreign and a bit overwhelming, if it is something that is totally new to you. Start by looking for spiritual ideas and practices that resonate with you. Trust that you are feeling called to certain things for a reason. This is your unique journey. It is about you and your evolution. That means your path doesn’t have to look like anyone else’s. Do your best to keep this in mind on your journey. 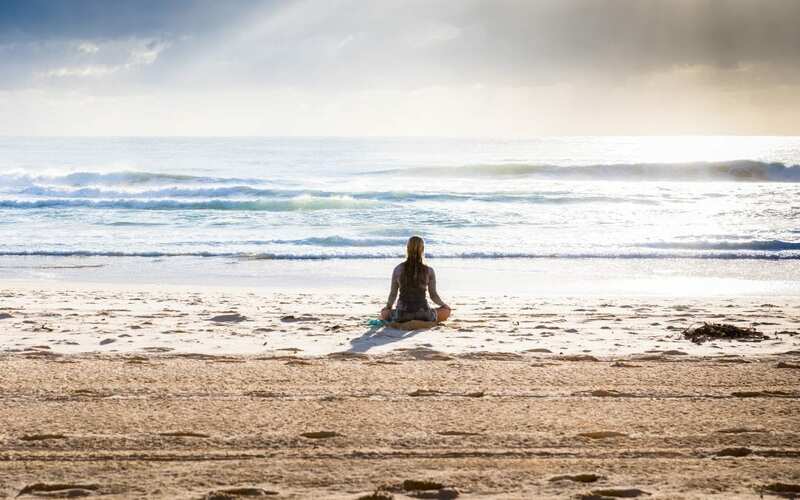 Working on bringing moments of stillness into your day will create space for your awareness and connection to yourself and source to grow- stillness and quiet are where your inner wisdom and God reside. When you are feeling overwhelmed or you are searching for guidance take a moment to get quiet. Connect to your breath, take a few deep breaths and hold the intention of relieving guidance from your higher self or God. Give thanks in advance for relieving the guidance you are requesting. Then sit quietly for a few minutes. It may feel like a really weird practice at first but I promise the more you practice it and build your belief in its power the more you will love it. You might not get an answer right away but if you stick with it and keep believing and practicing you will relieve the guidance you seek. Come back to stillness as often as you can throughout your day along with intentionally making time for it during your day. I like to begin and end my day with a five-minute meditation followed by a five-minute gratitude practice. And any time throughout my day I feel myself getting anxious stressed or overwhelmed I take a minute or two to be still and let go. There is nothing more powerful than gratitude to raise your vibration and help you on your spiritual journey. You made the choice to come to this planet at this time for the evolution of your soul. God, Spirit, the Universe wants nothing more than to support you on that journey. Energy is the language of the universe, and your thoughts, words, and actions all create their own unique energy. All of that energy is sent out to the universe, source, God. That energy is received. The universe sees the energy you are creating and the things you are focusing on and sends you more of that. That is why gratitude is so powerful. Gratitude elevates your energy and it sends the universe the message that it should send you more of the things you are expressing gratitude for. This is why gratitude has the power to transform your life. Your body is an essential part of your journey here on earth. You are not your body. You are a soul who made the choice to come into a body as the next step in your spiritual evolution. Your body holds so much wisdom and can teach you so much if you take the time to listen to and connect with it. It is sending you messages all the time about what it needs if you learn to listen. Connecting with my body was a huge part of my spiritual journey. The first twenty years of my life I saw my body as the enemy. I perceived it as being against me instead of being on my side and being a gift for my spiritual evolution. Maybe you can relate? Maybe you see your body as a source of discomfort and pain. or maybe you see your body as something to master and dominate. I know I did, but I promise there is a better way. Your body is a gift and it only wants to serve and protect you. For years I struggled with chronic mystery illnesses. No one could figure out what was wrong with me. So I learned how to cope. Then I found the practice of yoga and I learned how to connect to my body. Through my yoga practice, my relationship with my body was transformed. The yoga teachings allowed me to see my body in a new way. As my relationship shifted so did my chronic pain. I believe that the pain my body was experiencing was a call for a connection. My body was trying to tell me what it needed. When I started to listen, the pain subsided. Our bodies can be one of our greatest teachers if we allow them to be. I highly suggest starting wi this yoga class to connect to your body. Self-reflection is one of the most powerful tools we can use to deepen our connection to ourselves and source on our spiritual journey. It is such a powerful tool for transformation it is one of the eight limbs of the practice of yoga. When we choose to cultivate self-reflection we open ourselves to a whole new level of understanding. One of my favorite tools for self-reflection is journaling. Journaling allows you to reflect and gain invaluable insight In a non-judgmental way. It allows you to connect to your subconscious, your higher self, and source. The more you practice journaling the better you will get at setting your thoughts how easily onto the page. You may even be surprised at the wisdom that appears before you on the page. One of my favorite journaling practices, when I am feeling stuck or wanting guidance, is to grab my journal and ask a question. First I take a few deep breaths to clear my mind, then I set the intention that I will receive exactly what I need. Next, I say thank you in advance for relieving the answers I need. Then I write down my question and allow my hand to move across the page. I have been astounded by the answers I have received from is practice. They have been nothing short of amazing and they are often very simple. If this practice seems intimidating you can start with journal prompts like in this journal, you can also try stream of conscious journaling as well. Your Journal is on the way to your inbox! Just like anything in life if you are serious about it you make a commitment to it. Your spiritual journey and life can’t flourish without commitment. Start with whatever practices have resonated with you. Make time in your schedule daily for these practices. As you progress on your spiritual journey take the time to re-access where you are and make adjustments accordingly. A few months into your practice you may find yourself gravitating to new practices. You may also find your priorities in your life shifting to bring your life into greater alignment with your spirituality. I know when I practice yoga daily and make time for stillness, prayer, and self-reflection a lot of things shift for me. I don’t need as much sleep, I don’t crave junk foods, instead, I gravitate to fresh veggies, and I find myself prioritizing cultivating deep meaningful relationships, along with my connection to God source the universe. So don’t be surprised if your priorities and values start to shift once you start your spiritual journey. Relationships are a huge part of our lives and it can be difficult when first starting out on your spiritual, journey because your family and friends might not understand what you are doing and why. This can make it really challenging especially if they are not being supportive. This is where finding a community is so important. Having like-minded friends who are also choosing to live a spiritual life is really helpful. They may be going through or have been through similar experiences and can be helpful and compassionate. You can find community both in person and online. Yoga studios, meditation centers, spiritual centers, and even health food stores can be great places to meet people in your local area. If you are looking for an online community, you can join my free community. You can also find people by searching # on Instagram and Twitter. Being open minded on your journey is crucial. Embarking on a spiritual journey is bound to lead you outside of your comfort zone and expand your mind. Do your best to be open to new things and ideas that go against the things society has programmed you with. For example, many people on our planet believe we are the only planet with life. Many people also believe that only things they can see with their eyes are real, but our eyes can only see a very small range of what we call visible light. I invite you to suspend disbelief. To instead approach new things and Ideas with an open mind and childlike wonder. Before you write something off as too woo-woo try it out for yourself, give it an honest chance. If you are drawn to something its probably for a reason, even if its a little out there or out of your comfort zone. These are all fantastic tips. I really need to take more time for self-reflection. 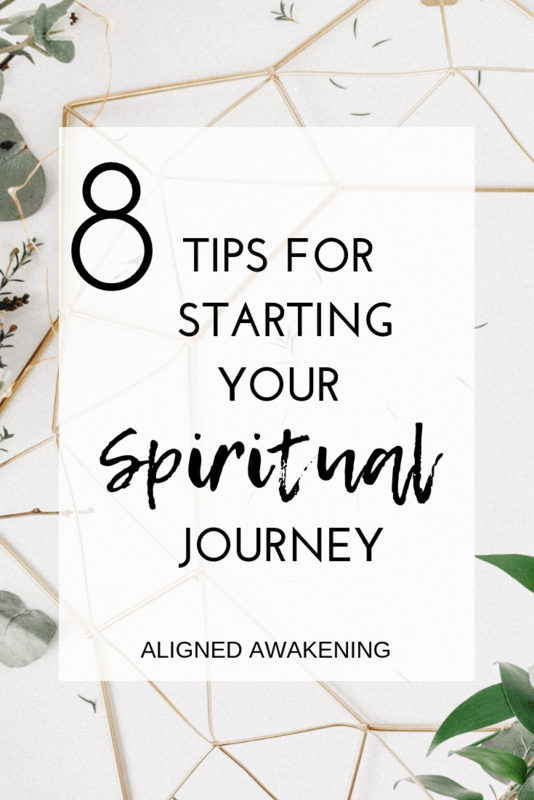 I’ve been on my spiritual journey for over a decade now and I have to say that all of these tips are spot on, especially “start small.” It can be so overwhelming at the beginning. Nice post! Thank you so much Jess! I am so glad that you agree 🙂 I have been on my spiritual journey for over a decade as well and it always helps to remember the basics. This literally took me back to when I was all over the place and finding myself beginning my spiritual journey. Gratitude, stillness and really understanding your own body are key! The more you are connected with yourself the easier it becomes. Aww, that is so awesome I am so glad! Yes I totally agree being connected to yourself and your intuition make life so much better. Practicing gratitude has literally changed my life in so many ways. I am so grateful for the journey and the opportunity to be here and grow. Get Your Free Spiritual Growth Journal! Your Journal is on the way to your inbox now!